I know that there are a few Compass and Straightedge tools out there already, but none have the simplicity, accessibility or fun of a modern web application, so hopefully mine stands out. As I said, it’s little bit Geometry tool, and a little bit puzzle game. Throughout development I was conflicted about which was more important. I wanted it to be simple and stripped back enough that you could use this as a go to Compass and Straight edge app, but to make the natural playfulness of geometry to be as visible and as tempting as possible. In the end I tried to keep the two quite separate. The drawing area is completely free from outside influence, but there is also a “Challenges” box with achievement style goals. Hopefully this shows off the possibilities of construction and encourages people without getting in the way. If you are the type of person who prefers to make their own goals, you are free to ignore it all together. Truly fantastic. We worked through to Circle Pack 3 (in original circle) before getting completely stuck. Tell Geometry its difficulty curve is way off. Yeah, the lack of control I had over the difficulty curve gave some stress during development. Giving people more things to do when they get stuck on a shape was one of the motivations to add the “in origin circle” and “in X moves” puzzles. And you can always skip ahead and come back later. draw a polygon around the unit circle, split it into triangles, and then inscribe a triangle in each of those circles. So would it be possible to add some “inscribe a circle in a triangle” and “draw a polygon around the circle” questions as hints? The approach I used for the “in origin circle” was to calculate the required diameter of the packed circles and then construct it directly. For example Circle Pack 3 can be done like this: http://www.sciencevsmagic.net/geo/#0A1.1A0.0L1.2L3.0L4.1L5.4A2.8A4.5L11.5A11.1A16.16A5.2L1.1L3.32A2.38A3. By the way the spoilers don’t line-wrap so they go right off the page when shown. This is pure brilliance. I am hooked. Thank you. Now to attack the final 7 challenges! Can you confirm that all the challenges are possible in the lower number of moves? The square seems particularly doubtful in 8 moves. Also “circle pack 7” is possible in 13, if the lower numbers are meant to be minimal. I assure you they are all possible. If you need a hint I will tell you that the 8 move square is also an “in origin circle” solution. And don’t forget that extending existing lines is “free”. As for the circle pack 7, the minimal scores were just the best I found during development. I was hoping that someone would be able to surprise me with a better one and I haven’t been disappointed. Maybe I should go back and change it now there is a new record, but I think it’s kind of fun for people for people to know when they have bested me. Got them all, now can sleep. Will be using this in teaching soon. What other minimal scores have been beaten? So far I only know of the circle pack 7. I hope more start to show up though. I would love to hear how it goes in teaching, its really exciting that the game encourages people to engage with mathematics in a different way than usual. Have you (or anyone else) been able to get it to recognize a 17-gon? 10, 15, 20, 24, 30 and 32 work fine. I’m pretty sure my 17-gon is correct — I built it twice — but no luck getting it recognized. and it works okay. If you link the url for yours I might be able to find out whats happening when I have some time, but no promises. The easter egg polygons aren’t very tested. I still have not figured out origin circle pack 3 and pack 4. The rest I have. Thanks, really enjoying this. The square-in-8 one is driving me nuts too, though I’m only at 30/40 so plenty left really. Well at 40/40, but still haven’t hit the minimum moves on 5. Any way you can link to an “official” place to discuss these with spoilers? I don’t want to pollute this space with details. I think I have spoiler tags installed. Use [spoil*er] and [/spoil*er] without the *s to use them. Well, there is a bug somewhere. My 20-gon and 15-gon just disappeared from the list, after things got really slugging constructing a 30-gon and I gave up and reloaded the page. Sorry, I meant [spoil*er] without the s. I’ve edited out comments to fix them. Sorry about the bug. I can’t make any promises about the behavior of the Easter egg polygons. Can’t nest deeper so responding here. Thanks! That looks like the same construction I used, so I probably just made a mistake. Other than them occasionally disappearing from the list, everything works great. Thanks for checking for me! Finally got the minimum number of moves for the square, octagon, and circle pack 4! Thanks again for making this. Now just have to give the heptadecagon another try tomorrow. Stretch goal: 51-gon! Loving this little piece of programming! keep up the nice work on this site! Nico, this work is amazing! It is elegant and simple to use. I have always meant to try my hand at this sort of geometry and this was a challenging and fun way to do it. 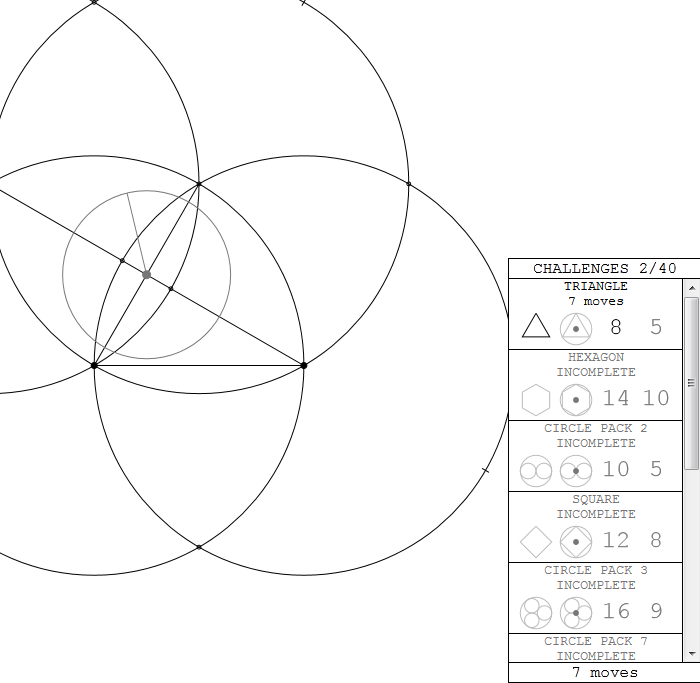 I did have to get some hints for the pentagons, but I discovered the pack 3 circles through just messing about. Brilliant! It would be nice to have the numbers counted separately for the construction vs in-original-circle. Otherwise you can construct something in the minimum steps and then take hundreds of steps to do the in-original-circle ones and your scoreboard looks the same at first glance. You could also add exscribed figure challenges as these are simple to understand but present a different (harder?) challenge. Thanks again for this wonderful tool/toy. May everything you make be this good. Am I missing something? I don’t seem to be able to draw lines that go _through_ a point. the points are the end points but I want that line to extend and intersect the circle. Is there something non-ancient-greek about that? Aha, drag the end-point afterwards. BTW you might also want to add a compass-only set of problems. Wow, this is absolutely fantastic. I have nothing really to say, just needed to express my appreciation. The smoothness of this tool is amazing, and it’s a delight to use. Only 17 done so far, but I’m still plowing through! This is an awesome app. Shelley introduced me to it, and I’ve been trying to optimize existing shapes as well as make good approximations to unconstructable ones. Just now I actually got it to recognize a regular 7-gon! This is close to a regular 7-gon because (sqrt(105)-9)/2 ~ cos(2pi/7). Apparently this one’s actually close enough that the code thinks it IS regular. I was playing around with the 7-gon solution above and was able to reduce it to 22 moves and place it in the origin circle. How the square in 8 or less moves is done? Are you sure this is possible, nico? I cannot even do less than 9 using the “in original circle” method. The solution uses three circles and five lines. The circles are all the same size. There’s something strange about that spoiler. Whoops. I’ve fixed it now. Thanks. I’m definitely stuck on this challenge. There must be some obscure gimmicks that I didn’t know. As Pitarou pointed out, I got one of my clues wrong. It’s fixed now. Hey, fantastic work. I’m trying to get Challenge Pack 4 in 12 moves, and I thought I had it, but it seems I’m having some difficulty – a point should be clickable and it’s not, and I think it might be a bug? The intersection of the top circle and the vertical line, which is a point, should be clickable. Notice that the two circles intersected at a clickable point. I’m assuming there’s some other way. One way or another, any help / hints appreciated. How many moves do you have for circle pack 3 in origin circle? I have it down to 15 but it looks so ugly that I’m holding out for a cleaner solution. Wow, I didn’t think a pentagon in origin circle could be done under 15. Great job! 11 moves, wat? Can I have a hint? Sure: the important insight was that, if you imagine extending the pentagon’s sides into a star, then constructing a point of the star allows you to draw two sides of the pentagon without finding all of its vertices beforehand. Whats your hint for dodecagon in 17? Once you have drawn an edge of the polygon, you can extend it for free. The point where it intersects another circle can be used to construct another edge of the polygon, even if you only have one of its two vertices. It’s based on the same trick with stars—that’s enough to get you 18 without much trouble. But there are multiple ways to extend the sides of a dodecagon to a star, and one of them has a beautiful coincidence with the circles you’ve already drawn. After I posted that last night I ended up finding the 18 on my own! Star based construction definitely seems to be the way to go. Hmm … 11 eh ? I was just re-running my brute force pentagon in origin circle (22ish), after getting a plain pentagon down to 15, when I noticed a coincidence; when I’d worked out why that happened, and noticed a second coincidence (one of my early construction lines just happened to pass through two points I was doing a lot of work to construct), I found I could get rid of lots. Even so, I was pleasantly surprised to get down to 12. So … 11 eh ? circle 7 can be done in 13. Not in origin tho. Yeah, that was reported by Edmund Harriss last week (http://blog.sciencevsmagic.net/science/lets-play-ancient-greek-geometry/#comment-71). A really wonderful webpage. Two suggestions: I’d like to be able to create a random point, rather than construct it, and I’d like to be able to copy a length from one place to the other, although I’m not sure how that would be implemented nicely. Being able to just copy a length would be outside of the bounds of traditional compass and straight edge, because it requires a “sticky” compass. You can copy a length with a sequence of straight edge and compass moves, but it would change the nature of the game to make this a separate operation. I’m absolutely loving this! Lots of fun. However, I think I’ve solved the circle pack 4 but my solution isn’t being recognized. You got pretty close, but you didn’t quite draw the final circle big enough. If you zoom in on the point(s) where the big circle touches a little circle, you’ll see why/how you missed it. Undo and draw just the last circle again, watching the dots at the intersections very carefully. Yep! Thanks! I had the right idea, it just snapped to the wrong point at the last second. Got it now. Your very last circle is slightly wrong; it’s very close to, but not quite, tangent to the other four. It will work if you undo once and redraw it carefully. Great game! But I think it’s not recognizing all of my correct solutions. E.g., this one should count for circle pack 7 around the origin circle, right? It needs to be within the origin circle, not just around it. Confused me at first, too. Ah my mistake – I can see that the circles don’t quite connect to each other on the inside. They intersect or whatever. In 9 days, you’ve gotten quite a following already. I don’t remember who mentioned this first, but when it got mentioned again, and I got some help with the interface, I began to love it. I blogged about it here. It’s lovely, but one of them leaves me puzzled – I’d _swear_ I have the square in circle just right, but it’s not recognizing it at all? The circle that it has to be in is the first circle you make. Not just any circle. Accidentally made one when trying to optimize a nonagon. Because it isn’t a regular octogon? The diagonals do not bisect the right angles. You drew the last two circles (the two centered on the vertical axis) incorrectly. They should use the diagonal of the center circle as a radius. They way they are drawn, they are using the endpoints of the vertical line segment as centers and are tangent to each other at the center of the octagon. After you hit “reset” there are two points, and there are three things you can do: make a line between the two points, or create one of two circles, each centered on one of the points and passing through the other. Either of those two possible original circles works as an “origin” circle. I suspect, without testing, that any circle who’s radius is the same as the distance between the first two points would also count. You have a centered 3-packed circles, but the circles are packed within an “origin circle”. Imagine the circle you get in step 1 as “given”, and put the 3-packed circles within it. Then you’ll get it. Here’s a 3-packed circles in origin circle done in 17 moves. I don’t claim it’s optimal, but it shows what “in origin circle” means in this case. I’m having a hard time with something. After creating the 9-move 3-pack (http://sciencevsmagic.net/geo/#0A1.1A0.3A0.5A1.6A1.7A3.1L7.3L6.16A15), I want to create the triangle whose vertices are the points where the packed circles are tangent to the outer circle. Those points should already be created (right? basic construction: create the one or two points where two circles intersect), but I can’t seem to select them. Now, obviously, I can pin down those points with lines (two of them with lines that already exist), but I don’t think I should have to. Am I just misunderstanding what’s possible? 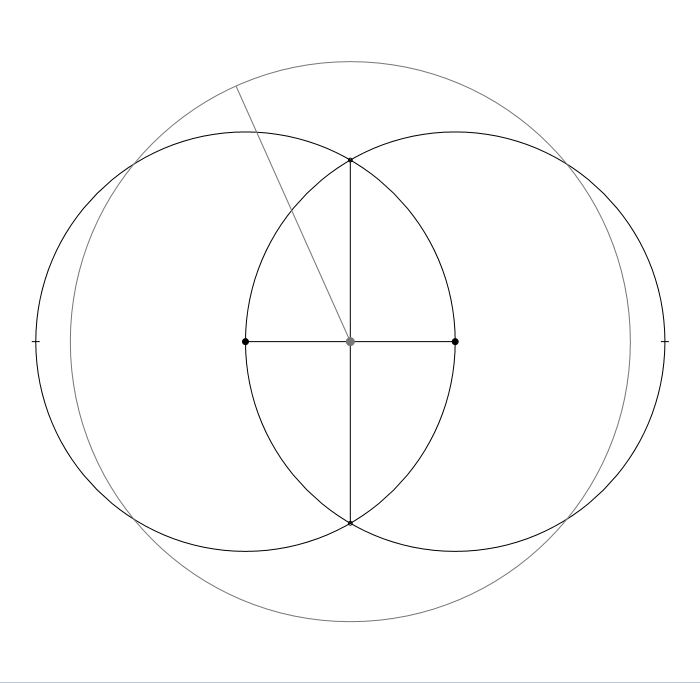 A previous hint said it was (a) inside an origin circle, (b) was done with three circles and (c) five lines. I’ll go farther by saying that the three circles are all the same size, and can be made before any lines are made. The first line I drew I needed to extend, but extending a line is a free act (the Euclidean postulates say that a line goes through two points, not that a line segment is terminated by two points). Is that enough to help? That answers one question I had… does it count as being in the origin circle if it isn’t in a unit circle centered on one of the first two points? And the answer is no. Believe it or not, this is not the square-in-8 I was thinking of. I was thinking of a different square-in-8 that also counts as in the origin circle. If you draw the first line 120 degrees rotated from where you did, the square will end up in the origin circle. Have a way to erase lines. Once I’ve bisected a line, I’d like to remove the circles I needed to get there. My app assumes that two line segments with sufficiently similar angles are supposed to be same and it’s 64-bit floating point numbers that are to blame for the discrepancy. (with maybe a little too much tolerance). So here your four line shape is treated as though it’s a two line one. Haven’t been able to get less for an hour. What is a 2-gon? If it’s what I think it is, why isn’t a 1-move solution possible? My app assumes that two line segments with sufficiently similar angles are supposed to be same and it’s 64-bit floating point numbers that are to blame for the discrepancy. (with maybe a little too much tolerance). So here a four line shape is treated as though it’s a two line one. It doesn’t seem to recognise either http://www.sciencevsmagic.net/geo/#0A1.1A0.2L1.1L3.2A0.6A0.8A0.3A0.9A0.2L6.6L8.8L9.9L3.0L10.0L7.0L5.0L4.0L11.0L12.8A14.6A14.2A17.1A13.3A13.9A18.0L1.0A76.1L78.0A75 or http://www.sciencevsmagic.net/geo/#1A0.0A1.3A0.4A1.6A1.8A1.2A0.3L0.0L2.2L8.8L6.6L4.4L3.5L1.1L11.1L12.1L10.1L9.1L7.3A13.4A18.6A14.8A14.2A17.0A13.1L0.1A76.1L73.1L74.1L4.4L100.1L2.2L101.1L3.3L105.105L106.1A75 as origin-circle circle pack 7s. Is this correct? That is correct. Neither 7-pack is within the origin circle. I was bored so I drew you guys a circle the size of the known universe (well, 60% larger because I’m generous)… assume that the smallest circle (between the 2 origin points) is the size of a gold atom’s nucleus (8.45 femtometres). The page has touch controls and works fine of the iPad I used for testing (although I’m not sure if it works on older ones). You should be able to save the page to your home screen if you want to use it like an app. This is awesome! I’ve wasted more time here than I care to think about. One note: It would be nice to have a “center” function. I managed to trip over my trackpad, and zoom my image down really small then sweep it off the visible screen, and after that could not get it to reappear in my view again. This was especially annoying as I was working on the pentagon! But I’m impressed if this is only your third program. Kudos, I’ve been enjoying it quite a bit! Refreshing the page will center your construction. Why is this no valid solution for circle pack 2 with 5 moves? It registers fine for me. Perhaps you have already solved it in 5 moves. The shape will only go dark if you create an improved solution (fewer moves for either the default or in origin solution). This is to avoid having shapes go dark all over the place whenever you retrace your steps. If you want to double check a solution that is no better then one you have, use a private browsing window so it is in a different browser session. I have a similiar problem. I have this solution: http://sciencevsmagic.net/geo/#0A1.1A0.0L1.0L4.4A0.0A5 on the first try. It did register that I solved it in 5 moves, but not that I solved it in origin circle. Am I missing something? Nvm, the origin circle seems to be the first circle that I draw and not a circle that has one of the two starting points as it’s centre. My mistake. Have you watched any video’s by Scott Onstott? Check out his youtube channel! Great game. Is there any way to save drawings made on this? -Maybe keep a list on the site somewhere of solutions people have found, including the ones in the fewest number of moves? -Maybe include some way for people to make (and maybe post) their own challenges? -It would not be too difficult to write a program to search for minimal solutions to the problems; perhaps you could use this to generate “minimal move” targets/give people some way to know they’ve found a solution with as few moves as possible? -Maybe also include some tool that can measure angles and lengths (assuming the distance between the first two points is 1) so people can check to make sure they’ve constructed what they think they have (of course this couldn’t be used to actually construct anything, it would just be a self-check tool). I dunno if you plan to do any more with this but I think these changes would be really cool! I would love it if people could create their own challenges. Maybe if I create a version 2 one day…. A bot that looks for minimal solutions sounds great, my source is available in the page, so anyone could write one. As is my app isn’t clever enough to know the exact values of lines in relation to the starting line. It just uses floating point values, so I think a ruler would be a bit of a disappointment. Is there a good definition of “in origin circle?” What defines the “origin circle?” I’ve managed to do some of the constructions centered about one of the two original points but that doesn’t seem to satisfy the “in origin circle.” Is the origin circle the circle defined with the center at one of the points and having the other point on its circumference? oops, let’s try that again. The origin circle is the first circle you create, so far as I can tell. Circle pack 5. not in origin circle though. Great fun. Does this get recognised. Beat all the challenges, but my save reset. Oh well, glad it happened now. For anyone who has done all the secret challenges and wants another one, try the Nepali flag. It has a geometric construction defined on its wiki page, and doesn’t seem too hard to do. What is the meaning of the two numbers on the right of each challenge? The right most one seems to be the minimum number of moves. What about the left one? It’s just an easier goal for people who are just starting to optimize. I put in numbers that I thought would be relatively obtainable. The right most number was my lowest number of moves as of release, but lots of them have since been beaten, some by quite a bit. If I make a version 2 I’ll probably use the new best minimums. It is not working when I use Google Chrome. Is this expected? How can I solve this problem? Thank you for this puzzlers! There is 44 challenges though! I completed all tasks, both levels, but still got only 37/40 points :o(. Any ideas why? I haven’t heard of that problem before. Perhaps double check that you have all four challenges solved on each shape. This has got to be the best game I have ever played. I feel like it was designed just for me. It took a few weeks, but I have completed all the challenges. Please, please, won’t you add some more? Thanks so much Erik. I thought I was designing it just for me, but I guess there are quite a few of us. If you like you can create regular polygons that aren’t listed (like a decagon) and they will pop in, so it’s possible to get more then 40 points. Many shapes can be made in fewer moves then my challenges, try looking through the comments here for other people’s scores and try to match them. If you have any ideas for a whole new kind of challenge, let me know. I’m open to the idea of adding some more, but only if they make sense among the others. Just a question to understand the rules: In the following example, following the paradigm that lines should have infinite length (extend for free), shouldn’t I be able to create a circle with its center at the intersection of the line and the circle on the OUTSIDE areas (left or right)? On paper that would work of course, but here I do not get an option to snap to that intersection. You’ll have to first click on a point along the line you want to intersect and extend it out to the point you describe. The intersection at that point will otherwise remain hidden. But as you say, extension is free.Because the line already exists this won’t count as a move for the purposes of the challenges. Hi, found your site due to a recommendation in a local (German) computer magazine (c’t). (Even with – or maybe due to – the “rudimentary” surface, I personally prefer prompts instead of windows). Suggestion of mine for a new “challenge”: a=1 or r=1 rsp. (“origin line” instead of “origin circle”). Some of these are already solved thru the current things but some of them (e.g. octogon) require more steps than the “independent minimum”. I really like this new challenge idea! Solving the octagon this morning was lots of fun. Thanks HC. If I make version 2.0, it will have to include this! Is this what you had in mind, an octagon where one side is the initial unit segment? Nicely done, my best was 15 as well. Aha—but one of your circles is unnecessary, so you can do it in 14 moves, matching the origin circle record. This toy is so simple, so profound and so beautiful. Thank you! I have a copy of Euclid’s Geometry and would like to work through it using your program as an aid. Is there any chance you might add the option of disabling the challenges and the search algorithm that goes along with them? I guess what I’m asking for is… creative mode! Seriously, thank you so much for this truly wondrous little thing. If the challenges box is bothering you, the best solution might be to hide the div using a browser extension. The search algorithm won’t do too much then apart from the occasional shading (which becomes less often as your solutions fill in). The challenges never change what you have drawn, so I see the default as “creative mode”. What the smallest number in challenges mean? Is it just for simple case or for the “origin circle” case too? It would be helpful if I could delete or hide lines and circles. It would be much easier if I could delete things that I know are only for previous constructions. By the way, this game is great! I just wanted to say that it is a really fun and challenging game. Can someone explain the circle four pack in 12 moves? It’s driving me crazy. I had a break and today (boring Sunday) remebered this tiny little fun. In case of “Version 2” (or whatever number) what about an option to fill regions with “black” (I think colors would not be convenient for this page). Something like “right click” etc. This is brilliant. I am having a fun time with it, and it’s 90 degrees F outside in PR. “What is Mathematics” by Courant and Robbins has a brief but concise description of constructions, up to finding a square root. Very nice application! The challenges are very fun and at some points.. frustrating. 🙂 Overcoming the frustration and completing the puzzles has been gratifying. A suggestion: to rotate the view/change the viewing angle. New perspectives open new posibilities. Is there a way to trisect or pentasect an angle? It doesn’t seem to recognize my pentagon. Hi, is there a way to reset certain completed challenges? If the biggest circle has a radius of one unit, how large are the radii of the smaller two? Finally! I got the circle pack 7 in origin circle. I fiddled with it a while and tried to shrink my pack 7 into the origin circle. That someone found a way to do it in eleven is amazing, might be worth publishing it. I managed to get it down to eleven by extending the first two sides, and using the larger circle. A new record for me! I wonder if this is the same as Anders’ solution. Thanks for the suggestion. It worked. This program strikes me as really hitting a sweet spot in the realm of puzzles. Do you mind if I hack away at your code? I would like to make a much simpler version. I’m hoping to interest my 8 year old daughter with it. A student of mine found a 9 steps construction for the 3 circle packed in the original circle. I googled a lot but i did not find anything about. Is this interesting? Is it possible to modify the original post (9 steps -> 10 steps) and delete this couple of replies, pls? What a nice blog site it is ! It is a historical and informational site of geometry It discus with science vs magic I have visit this site and play this game and enjoy interesting.Recently I have seen a site like this It is ancient geometry for more information just click here,thanks. What did I do wrong? Hexagon can’t touch the same circle with every corner? Sorry, I’m not quite sure what you are asking. The constructed challenge is awarded the first time you construct the shape, which may or may not be at the same time as other challenges. It’s possible to have one solution qualify for multiple (or in some cases even all) challenges for a given shape. My mate just managed the 2-GON in 15 moves! Now I see that there are infinitely many hidden challenges for every k-gon (where k e N and k > 1). The program is simplified and works “only” for polygons with n <= 2^32. Quite practical though. Just a HINT. If you want to look at somebody’s solution and not have it remembered as yours in your cookies, open the link in Incognito aka Private mode. In Chrome Ctrl+Shift+N and in Firefox Ctrl+Shift+P. So I was puzzling over the dodecahedron (and other puzzlements), and was staring at your homepage, and realized I was staring at the solution (I think). Don’t know if you care, but perhaps you might want to switch the design that links to the game/application to something that isn’t a solution to one of the later puzzles? now the game is beaten!! Can anyone explain me why the game does not accept my pentagon (12 moves, not in origin circle) ? I can’t help but wonder if the challenge to complete the in-origin-circle triangle in 5 moves is a mistake. The way I see it, you use 1 move to create the circle, then you will use 3 to create the triangle, so you have just 1 other move to set up the triangle. After creating the origin circle, there are only 2 other possible moves, neither of which set up the triangle. Am I missing something, or is the right column supposed to read 6 for the triangle? Hint: the triangle is equilateral and you can set up the three vertices in just two moves. Thanks for the reply. Certainly a triangle is easily constructed in 5 moves, but I’m talking about the triangle specifically inscribed in the origin circle. First move is drawing the origin circle. The only other possible moves after that are to draw a congruent circle centered on the other non-origin point, or draw a radius or diameter line on the origin circle. Neither of those second moves sets up the three vertices of a triangle inscribed in the origin circle. The origin circle challenges are different from the minimal move count challenges. There’s one prize for getting it in 5 moves any old way, and another prize for getting unit circle in any old number of moves. circle pack 4 in origin circle is all i have left and i don’t know why it works help!!!! But I don’t understand what you did in the first place! Hail! If you’re following the recent Numberphile post, be aware that the paper version contains an error (which they get right in the computer graphics). The junk out to the left is a way of doing the early bisections without cluttering up the circle so much. Whew. Just bruteforced my way through a 42-step 7-pack in-origin. Not sure what an “ideal” solution would be, but I’ll be damned if I didn’t make mine work. trisect your diameter, construct your center circle from that, and then bisect the remaining segment of the diameter to find the center of your outer circles…..six times. register as the solution to Circle Pack 4 (in origin circle) ? The circles at top and bottom are popping out of the circle. I believe https://sciencevsmagic.net/geo/#1A0.0A1.0L1.1L4.4A1.6L7.3L2.4A9.0A10.0A9.4A10.28L1.1L29.2L34.34L7.7L12.12L4.4L11.11L6.6L33.33L3.3L15.15L0.0L14.14L2 is a regular dodecagon in 23 steps but it’s not being recognized. Totally stymied on getting to 20 steps! It’s close, but this isn’t a regular dodecagon. That a look at https://sciencevsmagic.net/geo/#1A0.0A1.0L1.1L4.4A1.6L7.3L2.4A9.0A10.0A9.4A10.28L1.1L29.2L34.34L7.7L12.12L4.4L11.11L6.6L33.33L3.3L15.15L0.0L14.14L2.2A34 this new circle shows that two sides aren’t even. I still don’t have the circle pack 4. Please fork the gist and add any improved solutions to it. I finally figured out an in-origin 4-pack in 12 moves!! Some squares are recognized. Others aren’t. Why? Fill in the blank to prove you are human: Fill in the blank: This post is about AncIent Greek ________.